While record-setting summer temperatures are being set across the nation, Gaylord Hotels are starting to decorate the resorts for their annual Christmas celebrations. Officials at the hotel brand announced this week that packages and tickets for Christmas at Gaylord Hotels, presented by Pepsi, are now on sale at www.ChristmasAtGaylordHotels.com. Every year from mid-November through early January, each Gaylord Hotels resort offers excitement for all ages with over-the-top holiday celebrations featuring millions of holiday lights, breathtaking indoor gardens and waterfalls accented with towering Christmas trees, fantastic decorations, live entertainment, and one-of-a-kind attractions. Each is a destination unto itself with diverse restaurants, spas, pools and water attractions, recreation, shopping and more—all under one roof. Hand-carved by master ice artisans from Harbin, China, the brand’s signature event – ICE! – is an interactive frozen fantasy world which is kept at a chilly nine degrees. 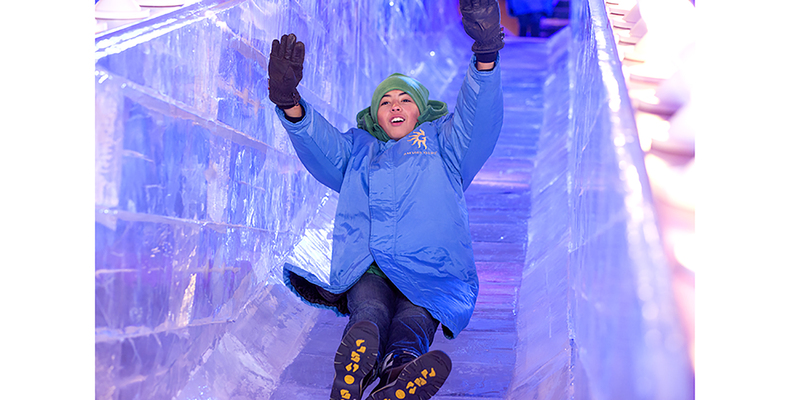 Master ice artisans travel to each resort from Harbin, China to produce brilliantly colored panoramas of hand-carved ice sculptures and multi-story ice slides for visitors to enjoy. This year presented by DEI, ICE! will feature A Charlie Brown Christmas by Charles Schulz at Gaylord National; Dr. Seuss’ How the Grinch Stole Christmas! at Gaylord Opryland; A Christmas Story at Gaylord Palms; and Rudolph the Red-Nosed Reindeer at Gaylord Texan. Returning in 2018 is an exclusive Build-A-Bear Workshop® experience that lets guests make their very own furry winter friend—Snowburst, a cuddly, cute polar bear plush designed for Gaylord Hotels that can be personalized with cozy winter clothing and accessories.